Find a vacation home to rent in Cochem-Zell from our list of vacation rental properties. Campaya has over 73 vacation homes available in Cochem-Zell, which give you the possibility to locate a unique accommodation in Cochem-Zell which completes your check-list in search for the perfect self catering vacation apartments in Cochem-Zell or vacation villas in Cochem-Zell. 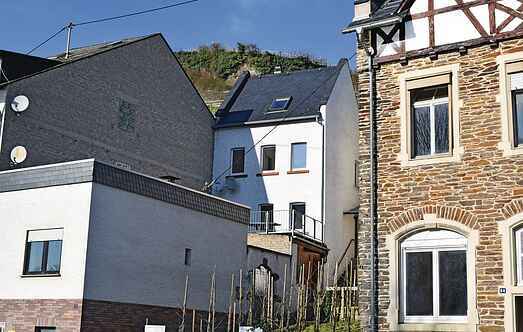 This neatly furnished and historical winery house is located on the beautiful hillside location right on the Moselle. This apartment is located in the beautiful wine growing town of Zell, on the Mosel River. Zell is located 24 km south of Cochem and 65 km north-east of Trier. This holiday property is situated on the edge of Mörsdorf, a charming village in the nature reserve Hunsrück. Situated in idyllic Lie, near the Mosel, is this cosy, family-run country house with five apartments (DHU121-125). In one of the most beautiful wine villages on the Moselle, Ediger, is this unique holiday home. It was built in the early 19th century and is located in the middle of the village. In one of the most beautiful wine villages on the Moselle, Ediger, is this romantic apartment for up to 4 people. The building was built in 1700 and is located in the middle of the village. In one of the most beautiful wine villages on the Moselle in Ediger, is this unique holiday home. It was built around 1700 and is located in the middle of the village.